Eucalyptus is bound to the Moon and Water. It is used magically for protection, purification, and health. Use leaves stuffed in sachets, pillows, and charms to carry with you, or put in your bed to maintain good health. You can also anoint a sachet with Eucalyptus oil. Place leaves in a mesh bag and hang under the faucet for purification rituals. Place leaves around the house for health and protection from illness and unwanted energies. Ring a blue or green candle with leaves or flowers for healing energies. 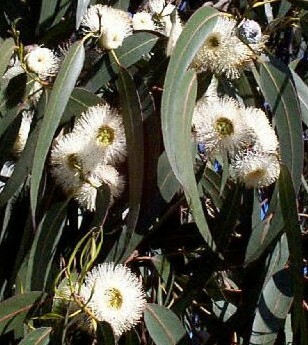 Cut a branch off a Eucalyptus tree and hang in a sickroom for the healing energy.